Adventures in bread – Last week, Kevin posted a video in which Chad Robertson of Tartine Bakery demonstrates the processes behind their three most popular breads. If you have twenty minutes and are interested in bread, I would recommend watching it. I’ll still be here when you get back. If you did watch the video, you saw a skilled baker at work. Kevin was kind enough to refer to me in his post as an “accomplished baker,” but (as I noted in the comments to that post) I am obviously nowhere near Chad’s level—which isn’t too surprising, as he is a professional baker and I am not. I suppose I am “accomplished” in the sense that I can usually accomplish the baking of a decent loaf of bread, but there is always so much more to learn. The video is not a tutorial by any stretch of the imagination—no measurements, times, temperatures, or other specifics are given, and most of the work that goes into each step is left out of the video—but it was definitely an opportunity for learning. You can see the skill and technique that goes into producing a good loaf of bread. If nothing else, I know enough about baking to know that what Chad makes look easy and effortless is in fact neither. I always find it inspiring to watch someone doing something well, no matter what that thing might be, but it is particularly inspiring when I have some small skill in that area as well. It usually makes me want to do that thing myself. This video was no different—even before the video was over, I was already thinking about doing some baking of my own. I had no intention of attempting to exactly reproduce the loaves that Chad made, but I did want to incorporate some of the techniques into my baking. 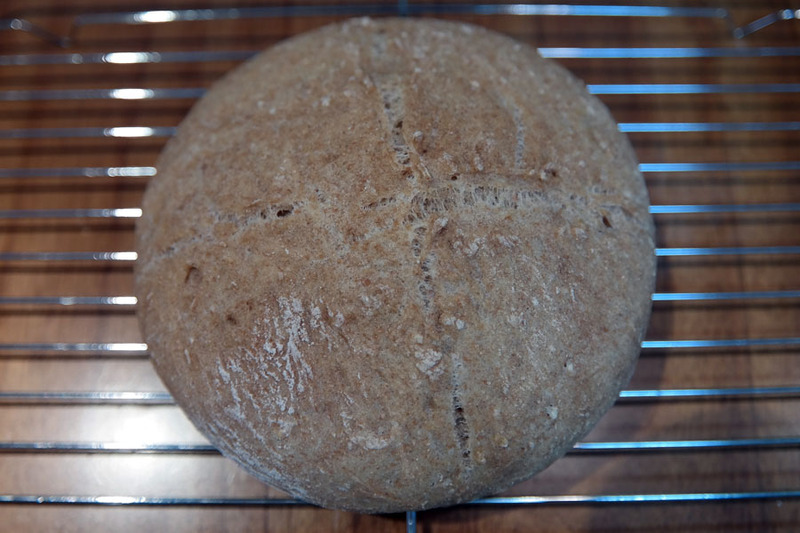 In particular, I was fascinated by the idea of baking a loaf in a Dutch oven. As I was watching him handle the highly hydrated dough prior to baking, I kept wondering how he was going end up with a loaf that had any sort of shape at all. Then, when he pulled out the Dutch oven, it all clicked. A little background on hydration might help for those of you who are not regular bakers. 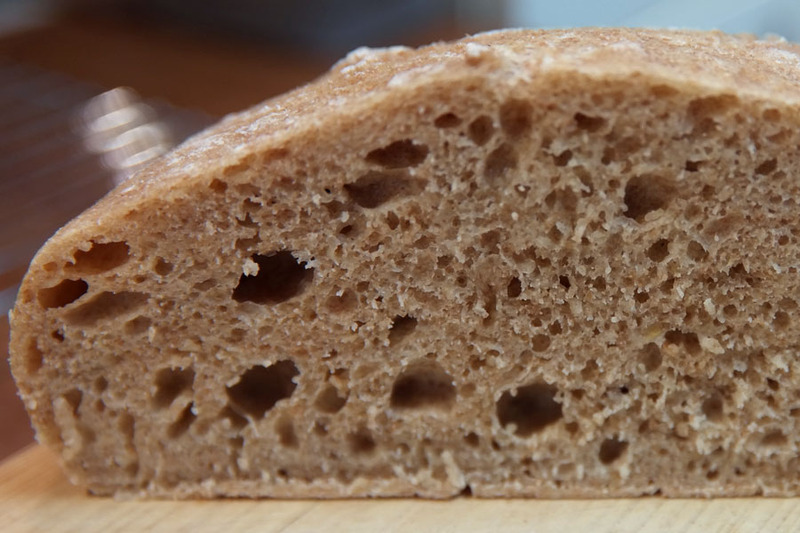 A highly hydrated dough will produce an irregular crumb (internal structure) with large holes scattered throughout the loaf, like what you saw in Chad’s first two loaves. A dough with lower hydration will produce a more regular crumb comprised of much smaller uniform bubbles. Now, you may like a regular crumb, and there’s nothing wrong with that—when I’m making a loaf for sandwiches or the like that is what I aim for. But it’s not just about the bubbles; a highly hydrated dough tends to develop better flavors as well. So what qualifies as a highly hydrated dough? My standard dough is usually somewhere around 66% hydration, give or take a few percent. This will produce a loaf with an even crumb and no big bubbles. But doughs can actually handle a lot more water than that, and the most highly hydrated doughs in my various bread books get up to about 85%. If you’re thinking that this sounds like an awful lot of water, well, it is, but it might not be as much as you think, because the percentages here are “baker’s percentages.” This refers to the percentage of ingredients (by weight) in relation to the total amount of flour used in a dough, not the percentage of an ingredient as a part of the dough as a whole. So, for simplicity’s sake, let’s say we are making a dough with 1,000 grams of flour (which would be enough for two decently sized loaves). You only need three other ingredients for the simplest of breads: water, salt, and yeast. If we go with 1% yeast and 2% salt, we would add 10 grams and 20 grams, respectively, of these ingredients. 75% hydration (for example), would be 750 milliliters (or grams) of water. This gives us a total weight of 1,780 grams, meaning that as a percentage of the whole, water would comprise only 42% of the dough. That’s a pretty significant difference from 75%, which is why I wanted to clarify. At any rate, a hydration of around 66% will produce a relatively stiff dough that is quite easy to handle and will not stick to surfaces (or your hands) too much—which is why I generally use this amount of water. Sometimes I will go as high as 70%, but that’s more or less been my limit so far. On rare occasion I have experimented with hydration of over 70%, but once the dough starts getting very wet it becomes much more difficult to work with—it sticks to just about anything and everything it comes into contact with: work surfaces, bowls, utensils, hands, small children, etc. It is, in short, a mess. The messiness can be ameliorated somewhat by using Chad’s technique of wetting your hands before handling the dough (something else I planned to steal for my experiment), but you still have to worry about the loaf retaining its shape while it is baking. You can’t just throw the dough on a baking pan and expect it to come out of the oven resembling anything remotely like a typical loaf of bread—the dough will spread out and flatten rather than rise. If you’re trying to make a ciabatta or flatbread, that’s fine, of course. But generally I like my loaves to have more rise. This is why Chad’s use of a Dutch oven made a light bulb to go on over my head. 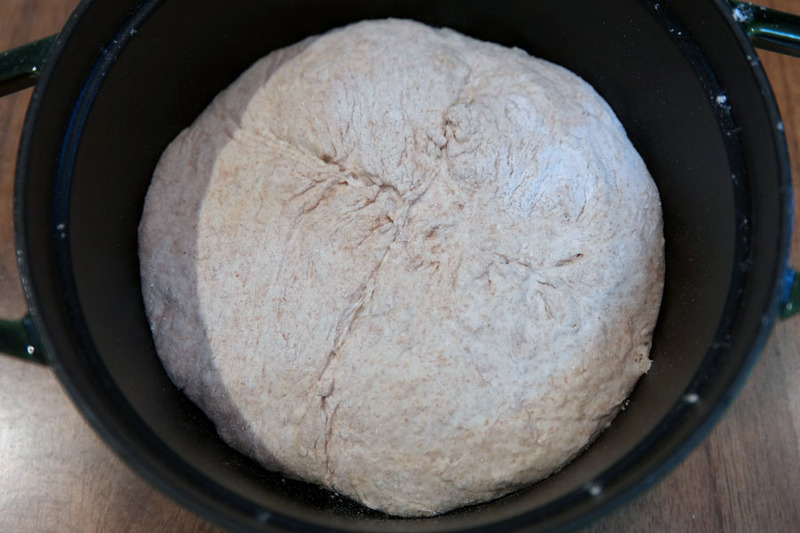 You could, of course, toss a wet dough in a bread pan, but the whole point of a highly hydrated dough is to get a rustic feel, and the rigid shape imposed by the bread pan seems to run counter to that. 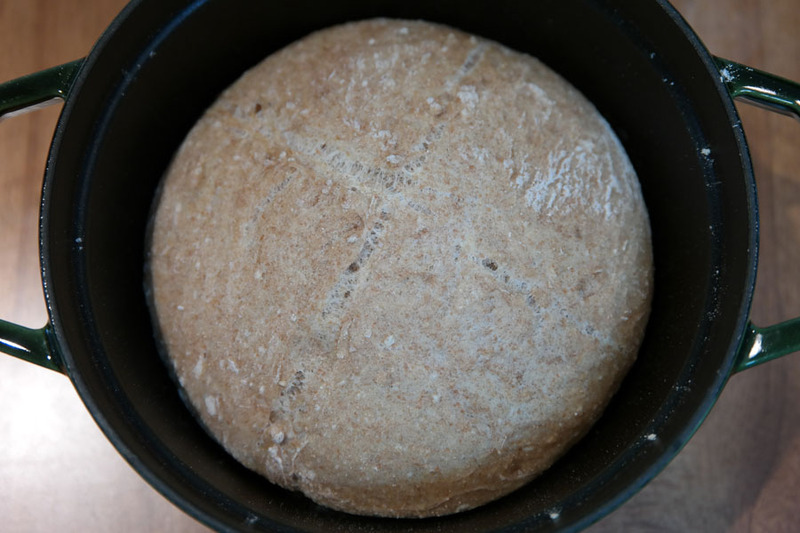 A Dutch oven, though, gives you the best of both worlds—it provides support while the loaf is baking and also allows for a more pleasing shape. And, as Chad points out in the video, having a covered vessel creates a steam chamber, which will in turn produce a better crust. Since we just happen to have recently acquired a Dutch oven, I simply had to try this. So the heart of my experiment was going to be a highly hydrated dough baked in a Dutch oven. I also intended to incorporate a long ferment—I’ve experimented with long ferments before and been very pleased with the results. But there were elements of Chad’s process that I was not going to be able to incorporate into my bread, the most important of which is the sourdough starter. I have always wanted to try cultivating a sourdough starter, but the truth is that I don’t bake often enough to justify it. It’s not that it would be difficult; it would just be extremely wasteful, as I would end up throwing away large amounts of starter whenever it needed to be refreshed. Perhaps some day, when I have more time on my hands and bake on a more regular basis, I will try my hand at sourdough. That day is probably a long way off yet, though. I could compromise with a pre-ferment, which is a way of “cheating” a starter. 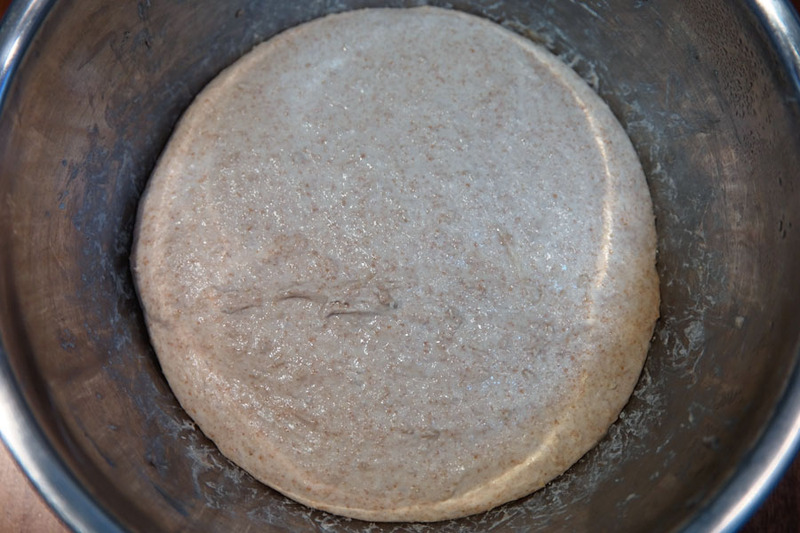 Basically, you mix a small amount of flour, water, and yeast and allow this to ferment for a while before adding the rest of the ingredients to make the dough. 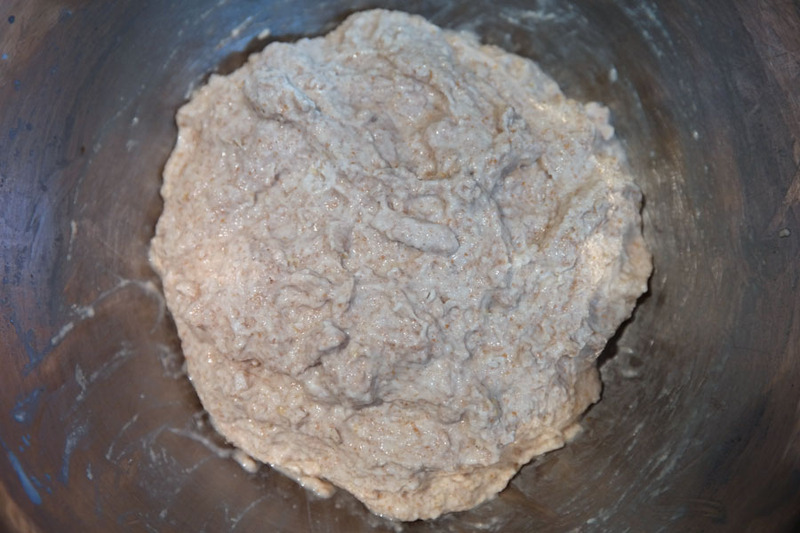 There are different types of pre-ferments, with some being very stiff doughs and others being more like a batter (for example, see the journal entry I linked to above, in which I used a poolish). I decided to forgo this, though, and try to develop flavor and texture solely through the long ferment instead. I also ended up compromising a bit on the ingredients. I had wanted to give the porridge bread a try, but I didn’t have the kind of oats that Chad used in the video, called “steel-cut” or “pinhead” oats. While I was watching the video, I was certain that I had a bag of them lying around somewhere, but later when I actually rummaged through my ingredients I came up empty. So I figured I would use old-fashioned rolled oats instead, only to discover that we were somehow out of those as well! The only oats that we did have were quick-cooking rolled oats, which I use to make my oatmeal in the morning. These are not ideal, but you make do with what you have. I would still get the oat flavor, but I would be missing the texture. The recipe I came up with was very simple. I was not sure how much to make, but after taking a close look at our Dutch oven (which is 20 cm in diameter at the rim) and doing some estimation based on my experience with loaves of various sizes, I decided on a 300-gram recipe (that is, using 300 grams of flour). The complete recipe, with baker’s percentages followed by actual amounts, is as follows. 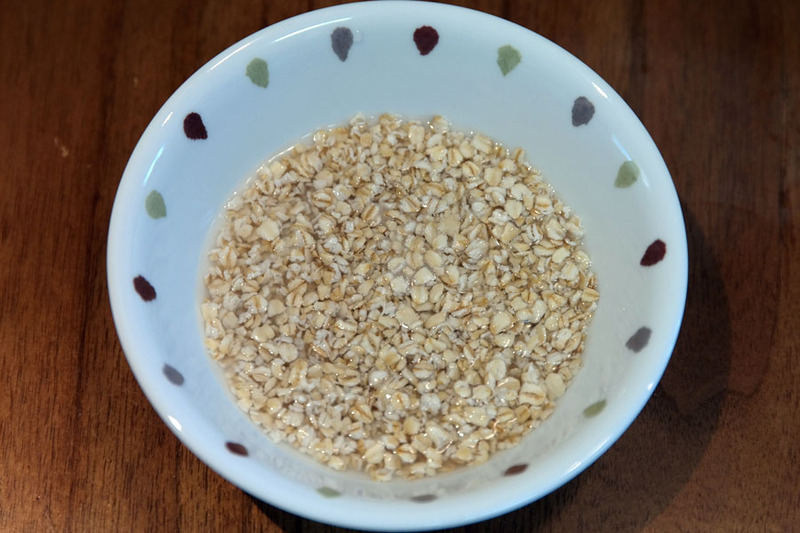 Although Chad cooks his porridge first before adding it to the dough, I knew that this step would not be necessary—all I had to do was soak the oats in water for a few minutes while I prepared the rest of the ingredients. Normally I would just dump the oats into the full amount of water and then add the remainder of the ingredients a few minutes later, but in the interest of photographic documentation I made things slightly more difficult for myself and soaked the oats separately, using 90 ml of the water. After about five minutes, most (but not all) of this water had been absorbed by the oats, as you can see in the above picture. I measured out the yeast and salt separately, again for the sake of photographic documentation. 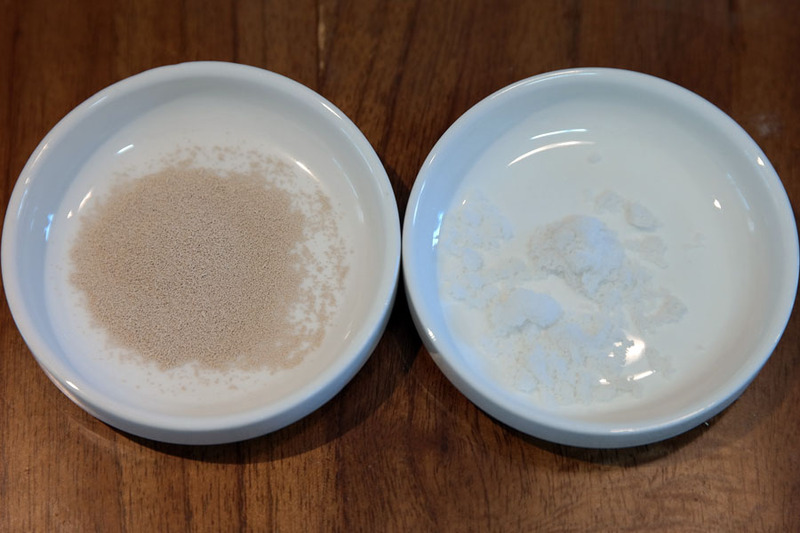 One comment I will make here is that salt varies greatly in density—sea salt is much, much less dense than table salt. The salt I am using is a rock sea salt that I have crushed in a mortar and pestle, and it is very light. The weight is what is important here, not the volume, so make sure you know the density of your salt if you’re going to be measuring it out with measuring spoons. 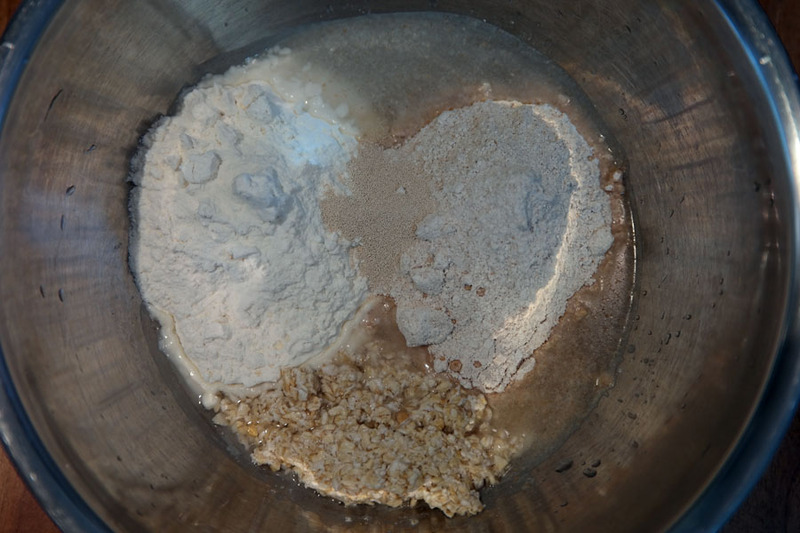 Here are all the ingredients, with the exception of the salt: the bread flour on the left, the spelt flour on the right, the yeast between them, and the soaked oats at the bottom. I mixed this together by hand, and it was very sticky and got all over my hands. I actually started out with 80% water—out of timidity, to be honest—but after a few seconds I saw that the dough would be able to handle even more water, so I added 15 ml to get the final hydration of 85%. Like Chad, I used a bench scraper to scrape as much of the dough off my hands as possible. My bench scraper is not nearly as nice as Chad’s though. Chad has nice equipment. This is what the whole lot looked like after it was completely mixed. If it looks like a gloopy mess and not like a dough at all, that’s because I didn’t actually do any kneading—all I wanted to do was make sure that all the ingredients were incorporated before the autolyse. I’ve used this technique before—basically, allowing the dough to rest after mixing and before kneading to let the starches absorb all the water. I figured this step would be even more important for a highly hydrated dough, and would save me some kneading time, so I let the dough autolyse for a full twenty minutes. I forgot to take a picture of the dough after the autolyse, but I don’t remember it looking all that much different, so I don’t think we’re missing much. Once the autolyse was over, I went in for the knead. I used Chad’s technique of wetting my hand (I used one hand to knead and one hand to hold the bowl) to prevent it from sticking too much, and it worked like a charm. I think I ended up wetting my hand a total of three times, but I stopped once the dough really came together. It was still incredibly sticky, but I was able to work it quickly enough to avoid having too much of it sticking to my hand. At any rate, the picture above is what I ended up with once the kneading was done. You’ll notice that the dough isn’t nearly as smooth as Chad’s. That’s mainly because the dough is 50% whole grains—you can see the flecks of bran and germ. It’s also probably because the dough stuck to my hand a bit toward the end and that made for a rougher surface. My technique still needs some perfecting. You can see here that the dough has expanded and evened out considerably. 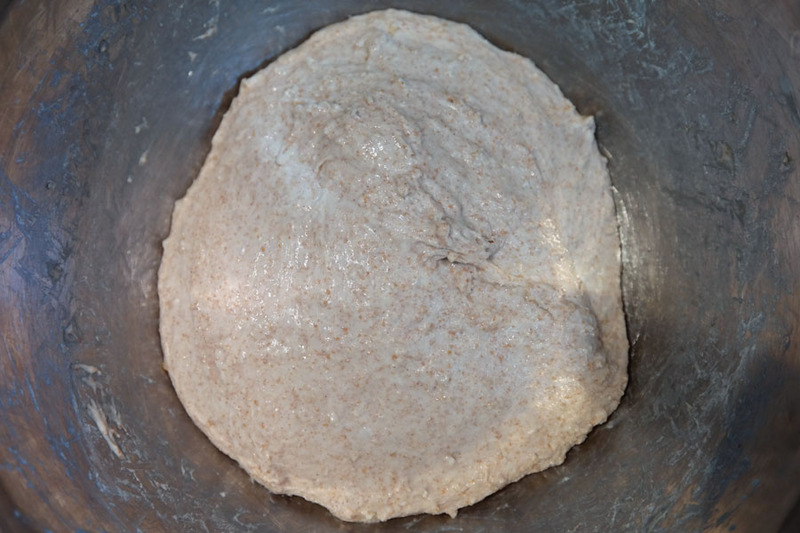 This is after a six-hour ferment in the refrigerator, followed by an hour out of the refrigerator to bring the dough back to room temperature. I did end up putting the bowl in another bowl of warm water at around the forty-five-minute mark when I noticed that the mixing bowl (and the dough) was still chilly. This was also when I turned on the oven with the Dutch oven inside to preheat. After an hour I removed the dough from the bowl (I had to scrape it out with a silicone scraper) and plopped it down on a floured table. I tried to be as quick as possible here and shape it into something that would fit into the Dutch oven, and I was eventually successful. However, in retrospect, I went about this step the wrong way. What I should have done was remove the dough from the mixing bowl immediately after taking it out of the refrigerator, quickly shape it, and then put it into a smaller bowl (lined with a floured towel) for that final hour of proofing. This would have allowed me to dump it straight into the Dutch oven with minimal deforming and degassing. You may be wondering why I didn’t do this, since this is what Chad does in the video. Well, Chad makes enough dough for two loaves and then divides and shapes the dough before proofing it in the banneton (the thing that looks like a basket). Since the entire amount of my dough would be going into the Dutch oven, I figured I didn’t need to take it out of the bowl it was proofing in. This was a mistake, and it is pretty obvious looking back on it now, but that’s what experimentation is for. Miscalculations aside, I did manage to get the dough into the Dutch oven, as you can see here. I attempted to score the loaf crosswise with a razor blade (actually, a thin box-cutter blade that I use solely for this purpose), but the blade kept catching in the wet dough, so I wasn’t very successful on this front. I later realized that dipping the blade in water would probably have helped. Another thing to remember for next time. Ironically, when working with a highly hydrated dough, water is your friend. The Dutch oven went back into the oven with the lid on, and thus began the stage of the process in which I had the least confidence. I had no idea how a loaf baked in a Dutch oven would differ from a loaf baked in the open on a baking tray. Would it be hotter in the Dutch oven? Cooler? I figured that it would be hotter, since the bread would be in direct contact with a preheated surface, but I didn’t know what this meant in terms of time and temperature. In the end, since this was an experiment, I decided to go with my usual time and my usual temperature: thirty minutes at 180 degrees C.
After twenty minutes of baking, I removed the lid of the Dutch oven, wondering what I would find. To my surprise, the loaf was not nearly as browned as I thought it would be. In fact, it was still quite light. I let the bread bake uncovered for a further ten minutes and then removed it from the oven. This is the bread still in the Dutch oven. You can see that my scores did indeed rupture, but I would have preferred a more pronounced cross. Still, it looked OK. My biggest worry of all, though, was that the bread would stick to the bottom of the Dutch oven. To prevent that, I floured the Dutch oven before putting the dough in, and when I took it out I could immediately see that it hadn’t stuck and was sitting free. When I tipped the Dutch oven, the loaf fell right out and into my (kitchen-gloved) hand. Here is the loaf cooling on the rack. What you probably can’t tell from this photograph is just how light and soft the crust is. I wasn’t expecting quite as thick and hard a crust as Chad’s bread—sourdough makes for a much firmer crust, so I was always going to be missing out on that—but I also wasn’t expecting it to come out so soft. I should have checked the loaf before taking it out and left it in for a little longer. It is pretty clear what went wrong: the Dutch oven was simply not hot enough. It’s not quite as crystal clear why this was the case, though. It could be that it needed longer to preheat—in retrospect, fifteen minutes doesn’t seem all that long. It could also be that the oven temperature wasn’t high enough. I suspect it might be a combination of these two factors. I don’t know how much I need to adjust each factor, but judging by how soft and light the crust came out this time, I think I have a lot of leeway still; I could probably get away with 200 degrees and a half-hour preheat. As for the baking time, I can always pop off the lid real quick to check on things along the way. Now, you might get the impression from my criticisms that this loaf was something of a failure. It was indeed not the ideal outcome, but it was far from a failure. At the very least, I knew as soon as I tipped the loaf out of the Dutch oven that it was fully baked, both by how it felt and how it sounded when I tapped on it. So I had that going for me, which was nice. The real test, of course, would be to cut it open and try it. And there it is, the big reveal. Ideally, you want to cut your bread after it has cooled completely, but this was still a little warm when I cut it. This was because it was time for dinner, and the bread was going to be part of that. On the positive side, though, there is something very nice about warm bread. Anyway, this might not look like much compared to Chad’s airy loaves, but I’m fairly pleased with it. For one, my bread is not a sourdough bread, which will affect the formation of alveoli (what those bubbles or cavities are called). It is also a 50% whole grain loaf, which means that it will naturally be more dense. Also, as I mentioned above, I definitely handled the dough way too much before putting it into the Dutch oven, and I probably lost a good amount of gas in the process. You can also see from the cross-section here that there is no real crust to speak of. Considering that this was an experimental effort, though, I am happy with the way it came out. 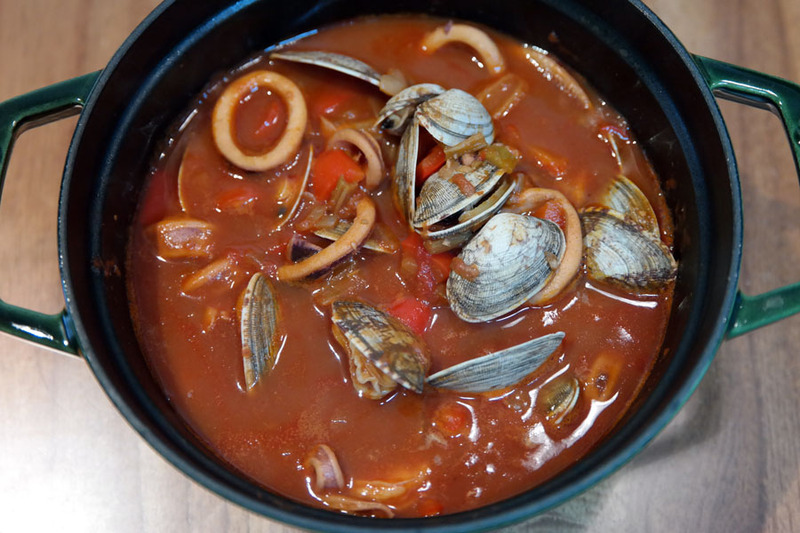 We had half of the loaf with dinner on Saturday evening, which was a tomato-based seafood stew of HJ’s creation. She was so happy with the way it turned out that I had to take a photo to include here. You’ll notice that the stew was made in the same Dutch oven as the bread—it is a versatile piece of kitchenware. And the stew was every bit as delicious as it looks. Probably more, actually, as the broth was made from a wide variety of vegetables plus Parmesan cheese rinds for extra umami. Back to the bread, though. It was very good, with a hearty flavor and a nice, springy texture. And even the crust was good, as soft and light as it was—I can only imagine what the bread would taste like with a proper crust. The remaining half of the loaf made for some nice toast on Sunday morning. I will definitely be giving this bread another shot in the near future, when I will apply the lessons I learned from this attempt. Now that I’ve been through the process once, I feel like I have a much better idea of what I am doing, and I’m looking forward to producing an even nicer loaf next time.